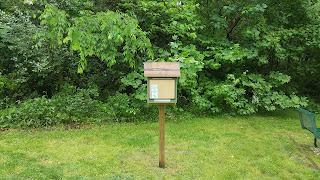 Have you noticed those birdhouse-looking things on posts filled with books around town? 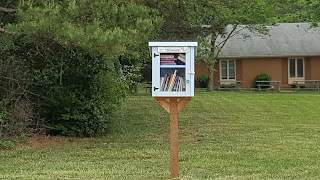 They are the local outposts of the "little free library" movement - a philanthropic idea started in 2009 by a couple of guys in Wisconsin. Accordong to the organization's website, what began as an effort to build 2,500 free book exchanges in the spirit of Andrew Carnegie - an early supporter of libraries in the U.S. - has exploded to over 36,000 mostly in the last 3 years. 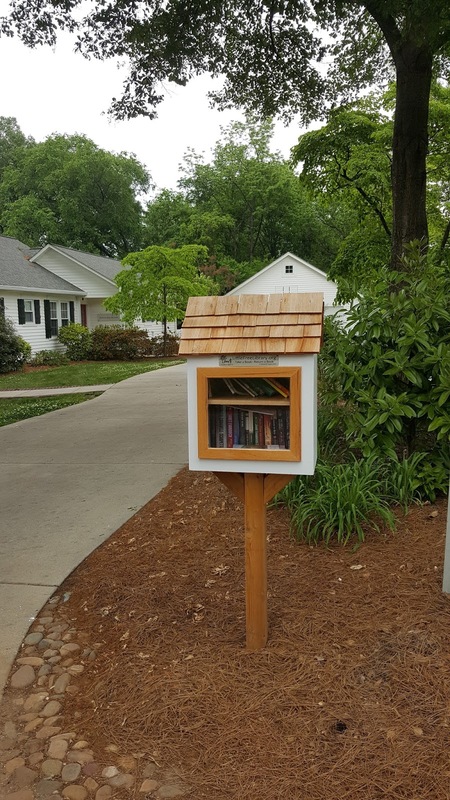 The idea is you bring books and exchange them with ones you find in the library you would like to read. There are usually a good number of childrens books, and it's a great way to encourage kids to read. 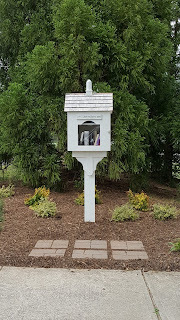 They love going to see what's in these little houses. Here are the ones we've seen around town. Know of any others? What's your agenda Mr Short? First, say that headline to yourself but do it with your best villainous cartoon character accent. Now, picture yourself as me sitting in Davidson Town Hall and being asked that question a few weeks ago by town staff – minus the Mr Short part, of course. We’re on a first name basis around here. Once you’ve stopped laughing or shaking your head, here is the answer to that question. 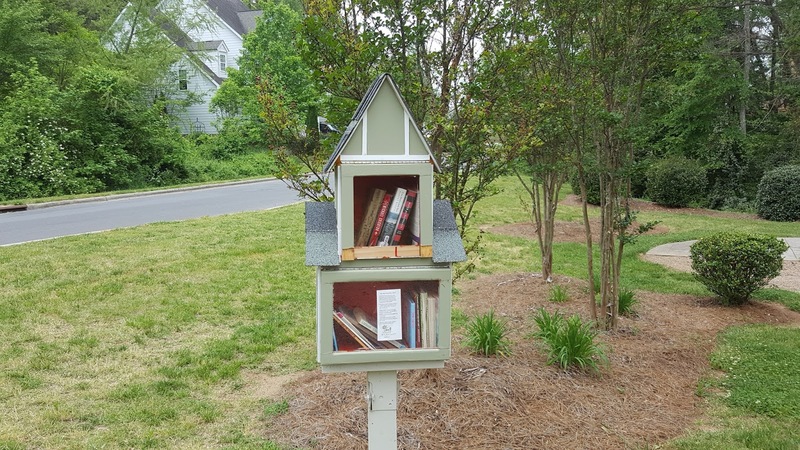 Over the years, yours truly has been pretty rough on the Town of Davidson – both in my blog and in the columns the Herald Weekly so graciously lets me write. If you were to go back and read through it all, you would see the recurring themes of improving transparency, exposing conflicts of interest, opposing bad ideas before they become costly mistakes, and generally holding local government accountable. If anyone wants to call those things an “agenda”, then I am more than happy to have them do so. Here are a few examples of that “agenda” in action. In recent years, Davidson tried twice to resurrect the bad idea of implementing 4 year staggered terms – a system that makes it nearly impossible to vote out a majority of elected officials in a single election. Both times, the idea never really got off the ground. That topic was a big one in the early days of my blog, and playing a part in stopping that is something I’ll always be proud of helping make happen. Over the years, there have also been several storylines involving conflicts of interest – many more than I cared to write. It’s a topic I’d like to never cover again, but unfortunately that’s very likely not going to be the case. Let’s certainly hope that turns out to be true. Then you have the category of the “big idea”. Big ideas are often accompanied by positive sounding adjectives such as “transformative”, or “progressive”, or even “necessary”. However, big ideas tend to also be costly, have long term impacts, and be rife with unintended consequences. Aggressively poking holes in those big ideas are the bread and butter of the “agenda”. When thinking of big ideas, think things like the Red Line, the I77 HOT Lanes, and the Catalyst Project. Davidson more than most local towns has seen the negative impacts a big idea gone wrong through its adventures in the cable business with MI-Connection. It’s not being melodramatic to say avoiding the next debacle of that magnitude is akin to a life or death situation for Davidson’s small town character. Plus, quite frankly if a big idea can’t withstand a little criticism, then it is probably also not a good idea. It has not all been criticism however. When they happen, it has been nice to call out positive things. Implementing tools for greater transparency is one area where Davidson has done a good job. The recent widespread use of streaming technology to broadcast all types of town meetings is one example where the town has made real strides. The town has also regularly been responsive to my public information requests. To be fair, when asked about my “agenda” for these columns it wasn’t taken as an ominous question, and it certainly wasn’t delivered with a cartoon villain accent. On the contrary, I took it as a compliment. It means these columns have the town’s attention, and that most definitely is a good thing. 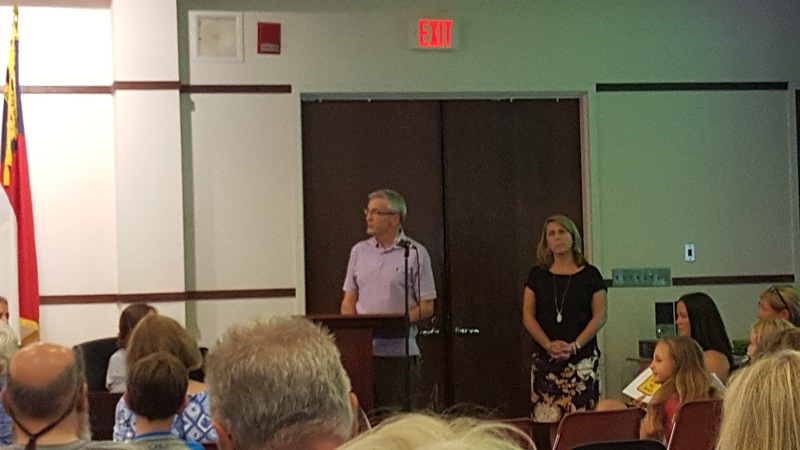 At Tuesday's Davidson Town Board meeting elected officials heard a presentation on a high profile information and enforcement initiative with the hopes of improving pedestrian and bicycle safety. Lieutenant Steve Ingram of the DPD and the Town Public Information Officer, Christina Shaul, outlined several aspects of the campaign. 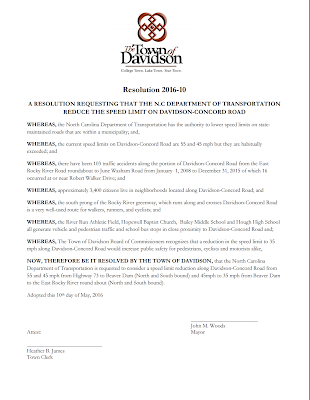 As aShortChronicle has reported on extensively, there is the ongoing effort to lower the speed limit on Davidson-Concord Road which was mentioned as Ingram began his remarks. 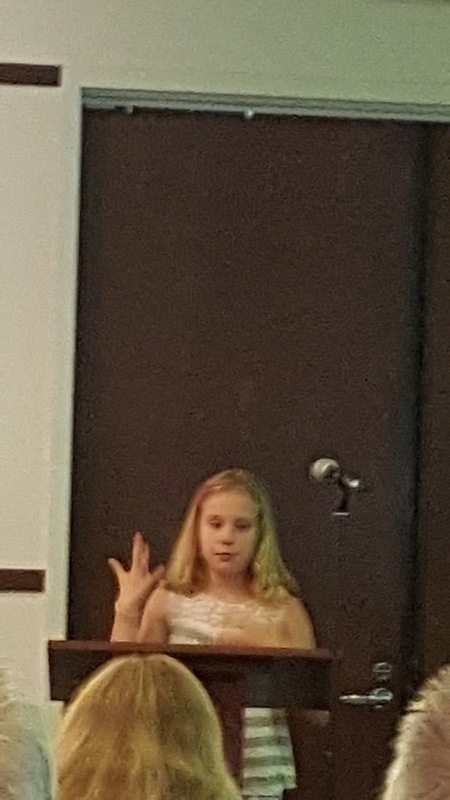 This presentation was about other initiatives on top of that. Lieutenant Ingram outlines multiple outreach efforts by the DPD. They include handing out fliers at the Farmers Market and tracking numbers of police contacts where pedestrian safety is discussed. Lieutenant Ingram also extended the offer of inviting DPD to your neighborhood event to have the police speak directly with residents. There will also be increased enforcement efforts. The town will be getting 2 more of the portable automated speed limit signs allowing DPD to rotate them more often around town. A $340 fine for not yielding to pedestrian in crosswalk was also mentioned. Finally, while there wasn't immediate enforcement planned for jaywalking (a particularly bad problem on Main Street) that was not ruled out in the future if warranted. The Town also plans to use its full arsenal of communication tools to spread the word including the town website, social media accounts, the eCrier email blast, the quarterly Town Message newsletter, and the regular meetings with neighborhood groups. 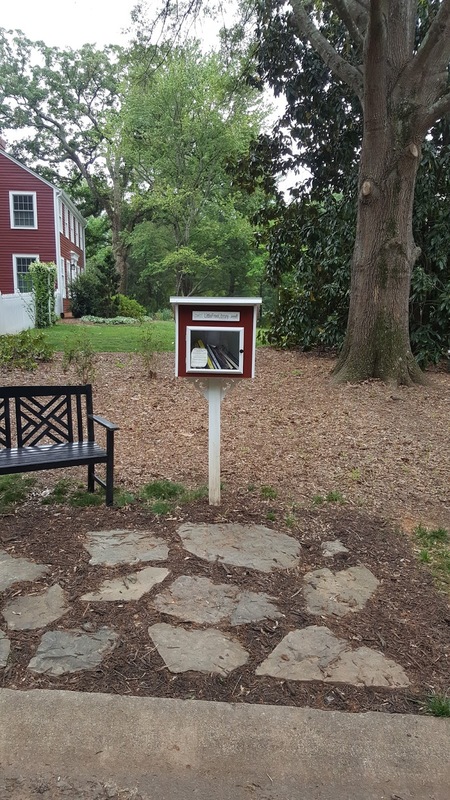 It will also engage with other institutions such as Davidson College, local hotels and churches. They'll even have access to slides at Our Town Cinemas as well as access to Mi-Connection. 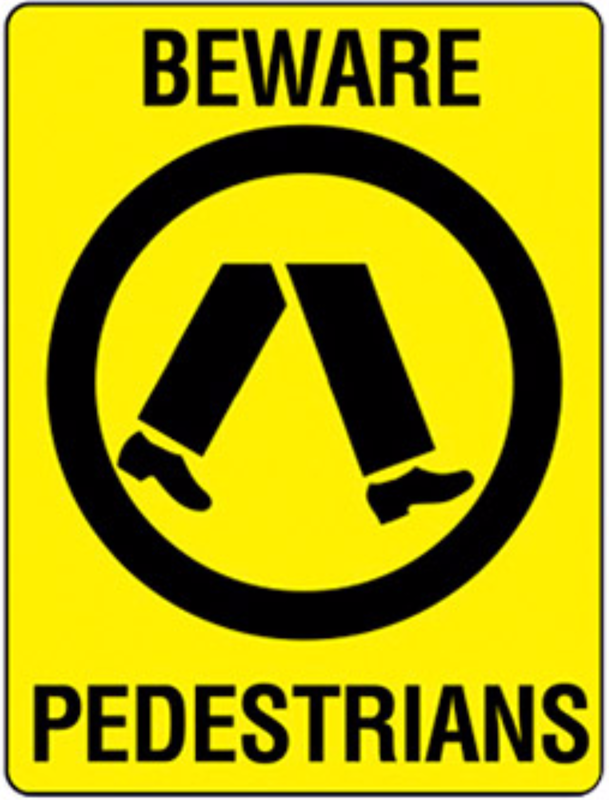 It sounds like you won't be able to go anywhere in town without hearing about pedestrian safety. That's definitely a good thing!!! 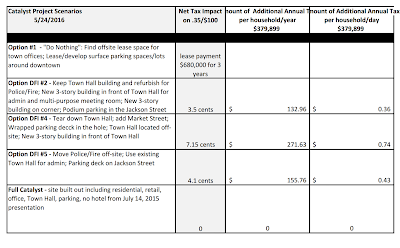 All of these actions should make a fair amount of improvement for residents. Now, if a way can be figured out for more non-residents who come through town to get the message, everything will be covered. That's one gap that's harder to fill. Maybe investing in signage for roadways entering town would be a good idea as well. How about this sign from Australia. Regardless something to bluntly inform non-residents that there are lots of non cars on the roads here would be helpful. 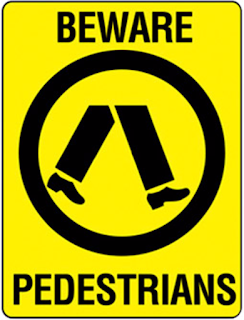 It was mentioned multiple times during the presentation that pedestrian safety is a pedestrian responsibility as well. "It is your responsibility to take care of yourself. 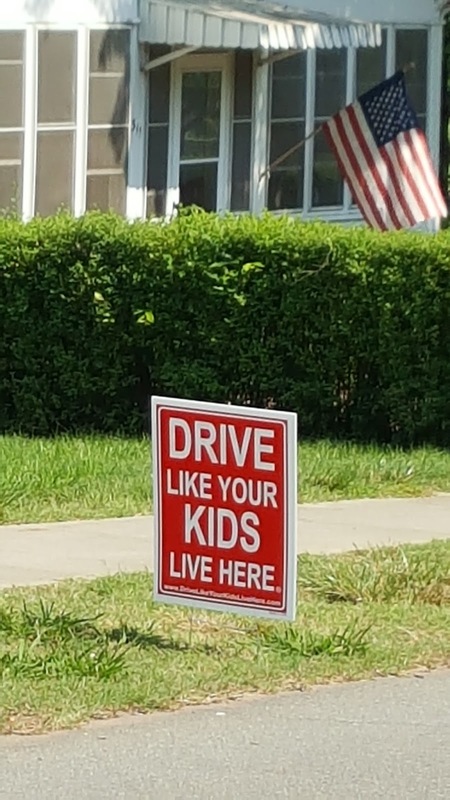 You are responsible for crossing the street. You are responsible for driving a car, but more importantly as a pedestrian whether you are in the crosswalk, or not, or jaywalking, or on the sidewalk, you are responsible for your own well being. " "We can put as many safety stops, and tickets, and cones out there as you all would like, but at the end of the day, you are responsible." As a strong proponent of personal responsibility, there is a lot of truth in Cashion's statement - for adults. However, it's also true that "kids will be kids". If the town is to live up to its pedestrian friendly moniker, it needs to make it safe for people - particularly kids - sometimes in spite of themselves. 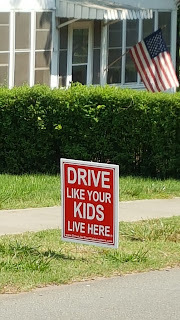 When the town bills itself as "pedestrian friendly", when there are crosswalks across a busy road like Davidson-Concord connecting to town greenways, and when the town approves development which makes all of that much more dangerous, the town does take on an element of responsibility for making it safer. For those reasons this new program is welcome. That being said, there is a lot more to do, and some of those things will be a lot more expensive than sending out more information. Watch the whole presentation here. It's about 25 minutes. And the survey says....No dogs at Davidson Farmers Market! 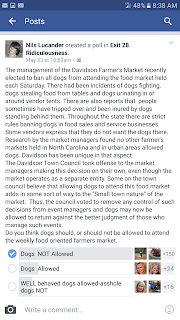 After a posting of the pictured story from the Herald Weekly on Facebook, Nils Lucander of Davidson posted a poll question on the subject of banning dogs from the Davidson Farmers Market to the "Exit 28 Ridiculousness" Facebook group. While certainly not a scientific poll, one day later the results were somewhat startling. Apparently, the high level of concern at Davidson Town Hall over how the ban was implemented would appear to be overblown. By a margin of 6-1 responses favor the ban with a smaller number saying it should be on a case by case basis. 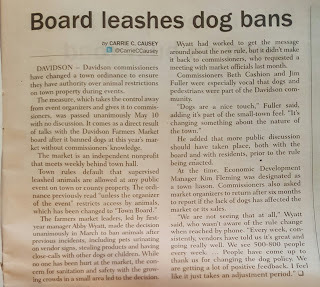 Davidson Commissioners have a lot on their plate right now. It's hard to believe they wanted to add micromanaging events to it. 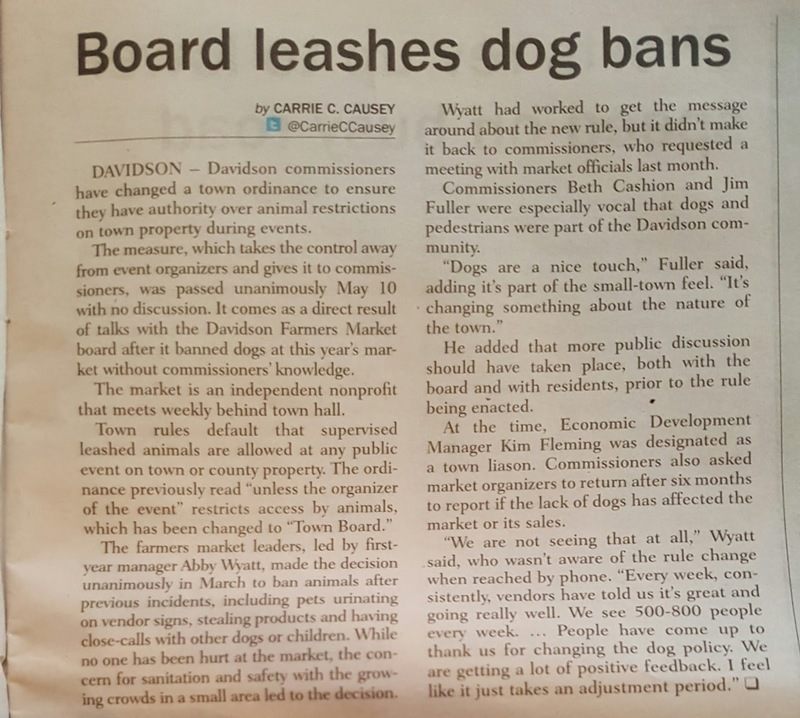 aShortChronicle wondered if the ordinance change passed on May 10th was retroactive and would override the DFM Board's decision. Per the town, the answer to that question is "no". 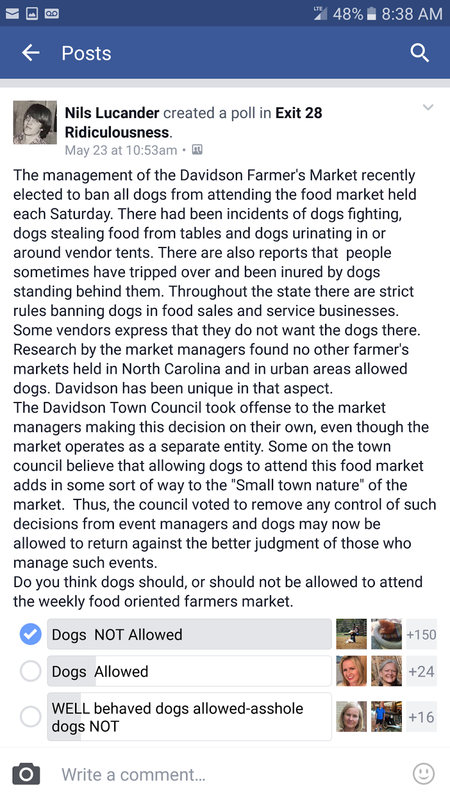 So for now it looks like dog owners should keep their pets at home when heading to the market on Saturday mornings. Here is another story on the no dogs policy from the Lake Norman Citizen. 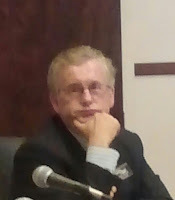 aShortChronicle has learned that the town has questions about the Transportation Impact Analysis completed back in March for the massive West Branch project designed by Commissioner Brian Jenest's firm. Those questions go above and beyond what we raised in this piece, and the Town has questions out to Ramey Kemp, the firm that did the TIA, for more data before it can be accepted. One of the main concerns we raised was that the baseline data for peak traffic did not completely cover the hours associated with pickup and dropoff times for local schools. "The trip generation counts shall be taken between 6 to to 9 AM and 4 to 7 PM to verify a local, more accurate trip rate." The detailed trip counts in the submitted Ramey Kemp document only cover 7-9 AM and 400-630 PM. 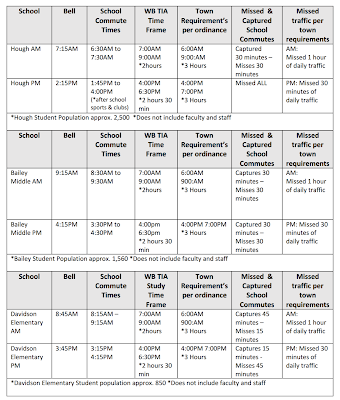 The "staff" here at aShortChronicle pulled together the below analysis to show how this could miss a portion if the traffic related to the main CMS schools in the area. This raises a couple of issues. 1. 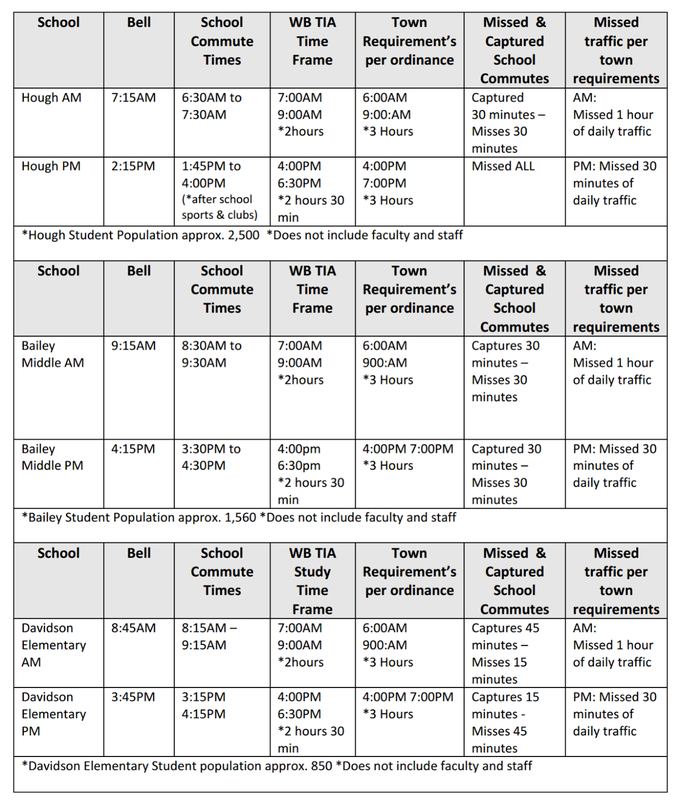 The town parameters in the afternoon miss a portion of traffic related to the bell schedules. Considering the number of trips generated as well as the potential for additional pedestrian activity, this is significant. 2. The Ramey Kemp time frame missed a significant portion of the AM traffic for Hough High than if it followed the town ordinance. As examples of why this is important, two of the most significant accidents in recent years at the Robert Walker/Davidson Concord intersection occurred during these "missed" time frames. One was the Mason Stewart pedestrian accident which occurred at 630am. The other involved multiple Hough High School students in a rollover accident at this intersection which occurred just before 3pm. "All required traffic studies shall be conducted at the expense of the developer by an engineer retained by the town." One would think the parameters for such a study would be clear. - and that day happened to be the day after one of only a couple winter weather events this past season (Feb 15th storm). Pull all that together and one may get the idea the baseline data might not be all that representative of your typical day. Stay tuned. More certain to come on this one. Bait and Switch coming on town affordable housing project? 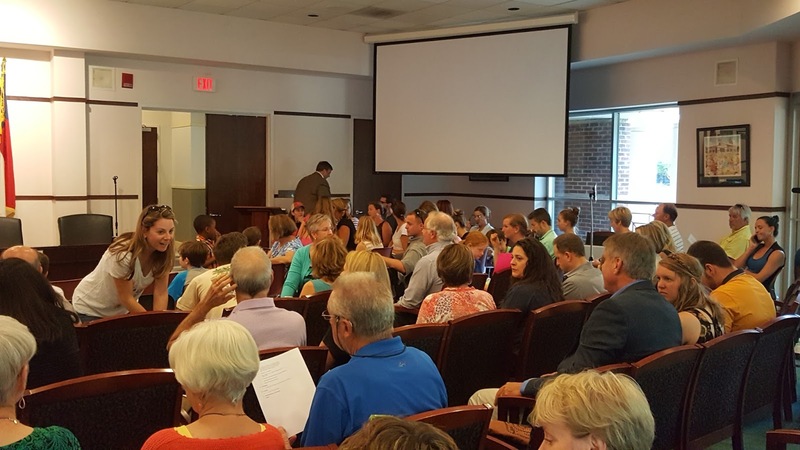 Tuesday's Davidson Town Board meeting has an agenda chock-full of potentially controversial topics. In addition to talking about the Catalyst Project, the Board will get an update on the use of the town Affordable Housing Payment in Lieu (PIL) fund. After a study which will be completed this month, the number one priority for this fund appears to be rental housing. used for multifamily low income rental housing." This is bound to cause problems down the road as most neighborhood HOAs don't typically like the idea of building rental apartments among single family homes. It will be reeeeeeaaaalllly interesting to see how this plays out with the town's current Affordable Housing project in Bailey Springs. Just last month Affordable Housing Director Cindy Reid said the Bailey Springs project was to be for sale units, but she did leave the door open for rental proposals. 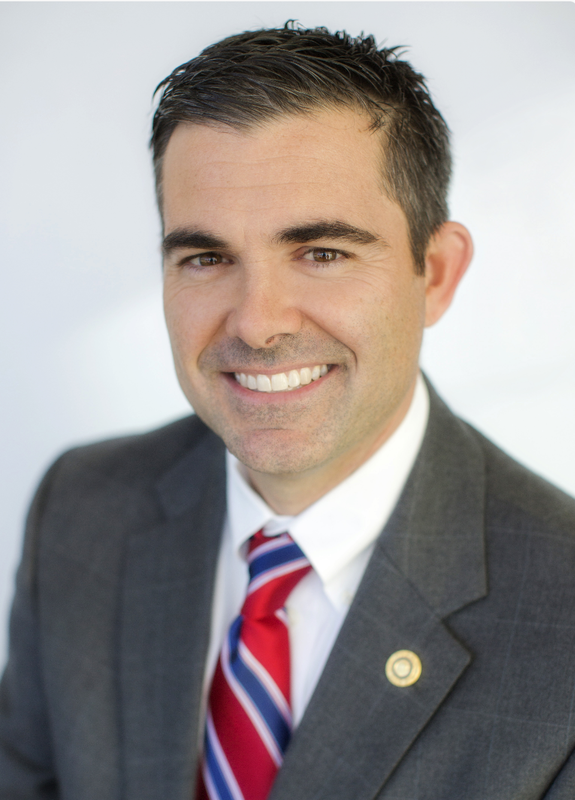 Reid was recently promoted to town attorney by Davidson Commissioners. She replaces long time town attorney Rick Kline. The RFP responses are due soon, so we won't have to wait long for that answer. Readers will remember discussions at the marathon Town Board meeting in April on the proposed revised "options" for the Town's controversial "Catalyst Project". After hearing from residents in a series of roundtables earlier this year, the idea of a hotel as part of the project appears to have been jettisoned. 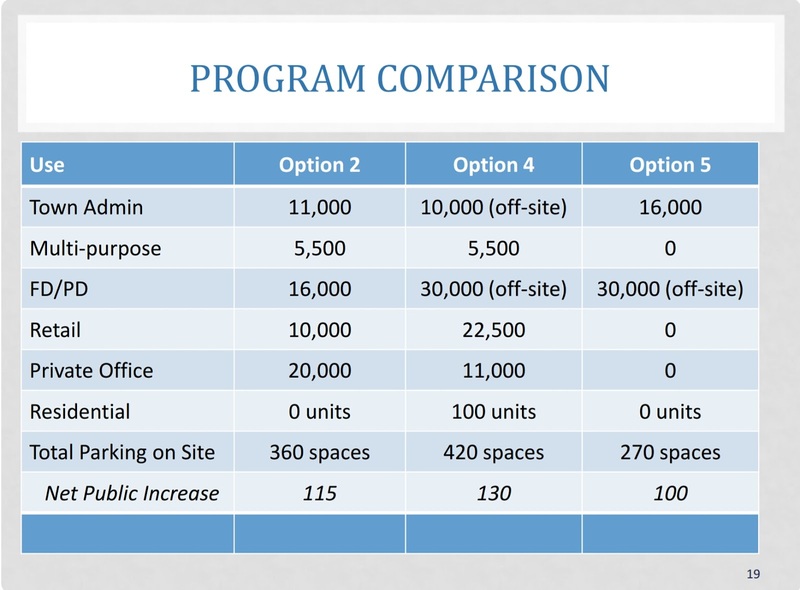 However, Commissioners asked the consultants from DFI to look at multiple other scaled back options and put price tags on them. 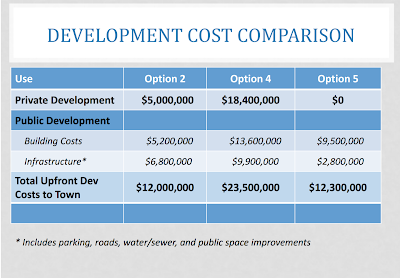 As was mentioned in April by Town Economic Development Director, Kim Flemming, the project under these revised options would take on a decidedly more publicly financed flavor. 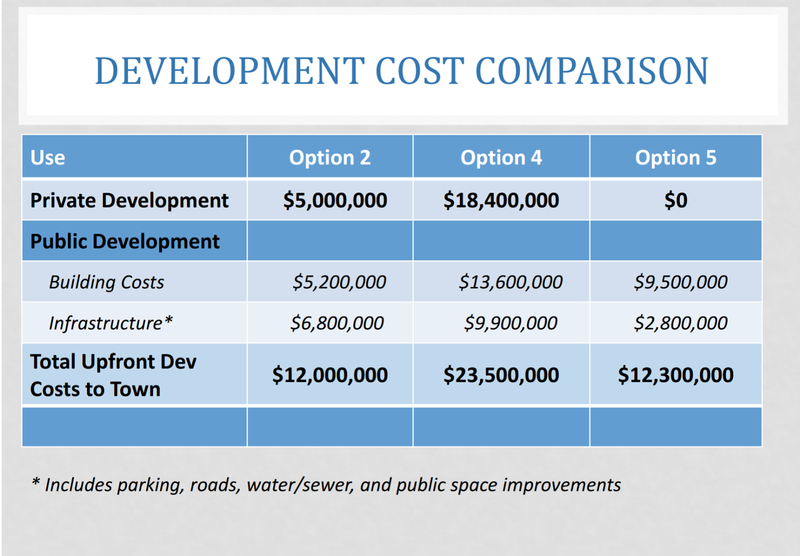 As part of Tuesday's Town Board agenda, Commissioners will hear a presentation about that public "price tag" depending on which DFI option (if any) are ultimately chosen. Here are the new option comparisons. 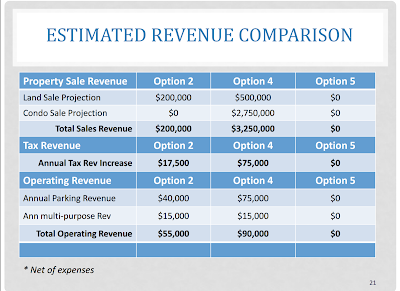 Here is the highlight slide on costs. 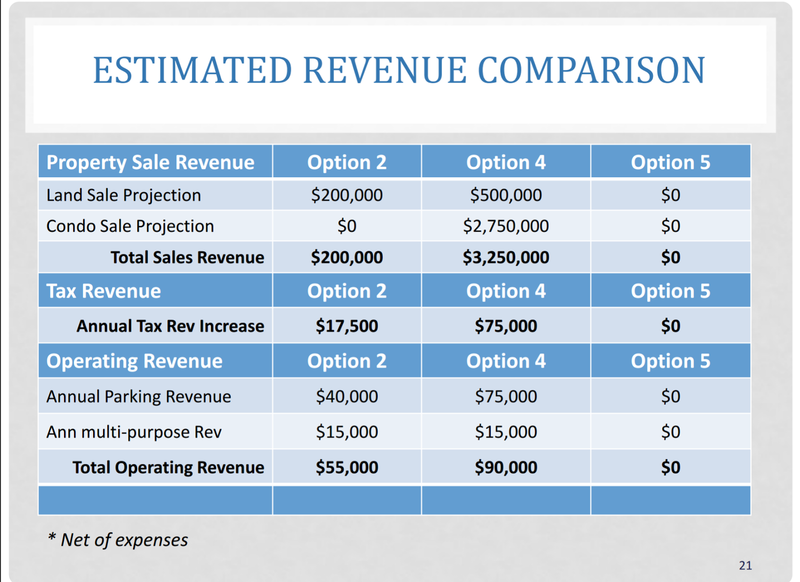 Here is the highlight slide on revenue. Those revenues however won't come close to covering the costs. Below are the possible tax increases that may come along with each option. As the town heads into the final turn for negotiations on the FY2017 budget, taxpayer need to keep an eye on this one. The Board has discussed placing a bond referendum on the ballot this November for Park/Greenways and Roads/Sidewalks. Add tax increases from those bonds (if they were to pass) to these numbers and it could add a good chunk to local tax bills. Davidson includes "transparency" in FY2017 budget. In a recent meeting with Davidson town staff, we here at aShortChronicle were asked an interesting question. Being asked that question makes us smile a little bit. It means we've got their attention. What was the answer to that question? In large part, it has around improving the overall sense of transparency in local government. Improving transparency should reduce the risk of repeating mistakes on the magnitude of MI-Connection. So to that end, it's nice to see Davidson including a couple of transparency related items in the proposed FY2017 budget which will be approved in June. 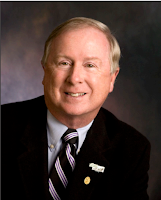 Davidson plans to spend $8500 on new software to improve the Public Records request process. The software from a vendor named Barracuda will allow the town clerk to more quickly search for emails across the system relating to a particular request. Over the years, Davidson has actually been very responsive to records requests from aShortChronicle. We've also instructed several other citizens on the how-tos if submitting requests as well. Seeing the town take this step to make this process go even better is a positive thing. We did recommend that the town implement a policy requiring elected officials always copy the town "Public Records" email box in the event they receive an email that should be public information to a private account such as their work account. Next year's proposed budget also includes a request for $21,800 towards improved technology for live streaming Davidson public meetings. This will be another step towards greater transparency by providing residents a more realistic option for watching meetings. Currently, meetings are recorded using an iPad and while greatly appreciated, the sound quality in particular leaves something to be desired. Since Davidson implemented streaming of meetings last fall it has grown from just the regular monthly meetings to include Civics 101 classes as well as off site events such as Commissioner Chats at the Egg and other public information sessions like the one at the Beaver Dam House for the east side parks. To date, 1900 user views have occurred which is likely several times the number of people who have actually attended these events. It's particularly useful for events that occur during the work day. Yes, $8,500 for an email archive and $21,800 for video is a lot of money. However, the more people who are involved and watching what Town Hall does, the better. If this money helps prevent anything even a fraction the size of the MI-Connection debacle, then it is money well spent. We've been unapologeticly rough on the town recently regarding the speeding issue along this road. The last post received a little pushback along those lines in the comments. However, we are glad to see things beginning to happen. As we mentioned in the update to the last post Rep John Bradford has gotten involved at the state level. From what we understand that has at least a little something to do with recent encouragement from official Davidson as well. On Wednesday evening, one day after the Board meeting, Rep John Bradford posted the below on his Facebook page. "I met with the State's Traffic Engineer today, Kevin Lacy. 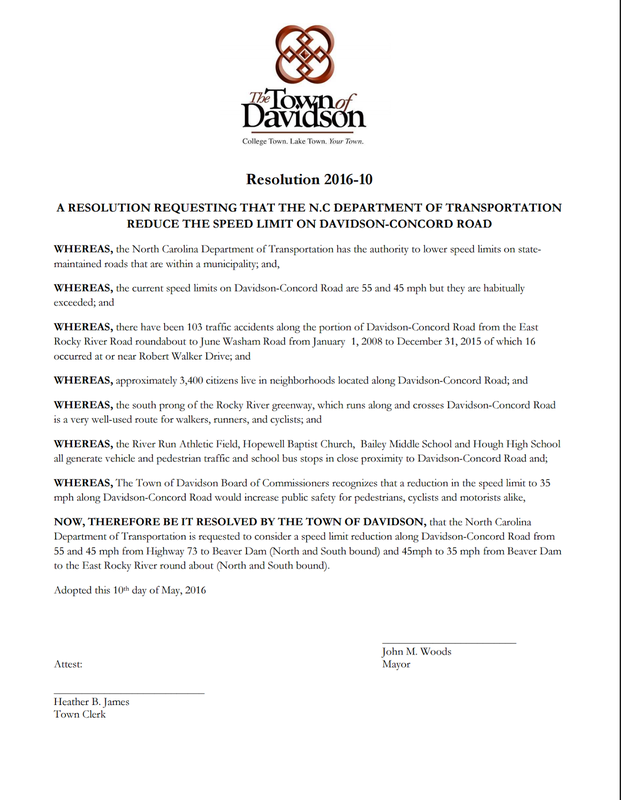 His department is responsible for establishing speed limits across the state We met in my office to review the Town of Davidson's Resolution. He committed that he would be willing to travel to Davidson to meet with Town officials, Senator Tarte and me. He agree he would personally tour/drive/observe the road to determine if the posted speed limits are still appropriate per NCDOT's speed standards. The next step is he is going to give me some dates of his availability so that we can all coordinate our calendars. For clarity, legislators do not set speed limits but Senator Tarte and I want to help which is why we will coordinate this meeting and site tour. My sincere hope is that a re-evaluation by the head of the department will yield a fresh perspective and lower speed limit. Stay tuned..."
A reader also pointed out something unusual happening right at the site of the videos we posted in this piece. What got the reader's attention? Some equipment that appeared beside the crosswalk at Appollinaire Drive first seen Wednesday morning. RRFBs are the flashing beacons like the ones at Robert-Walker Drive. While these beacons were mentioned by residents at the meeting Tuesday as not being all that effective, every little bit helps. Yours truly stood at the Appollinaire crossing yesterday and multiple cars passed without stopping. It will definitely be interesting to see how much these beacons do (or do not) improve things. Regardless, it's a very positive sign that things seem to be happening. 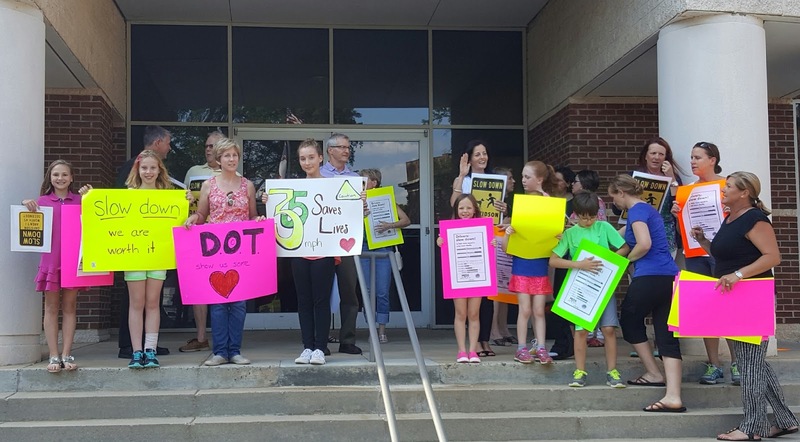 Town Hall gets an earful on "Davidson-Concord Speedway"
Davidson residents packed town hall Tuesday night - many of them children - to let officials know it's time to do something about the speed limit on Davidson-Concord Road. This was in spite of efforts by officials discouraging them from attending because NCDOT would not be present. Prior to the Board passing a resolution saying the town will ask NCDOT to lower the speed limit, 10-12 speakers took to the podium including several children to encourage Davidson to do something. While all were appreciative of town efforts in the past. It was made very clear those efforts are not enough. It was pointed out that nearly 2 years ago Davidson officials passed a similar resolution, but nothing has been done. Multiple speakers made reference to the flashing yellow beacons the town installed after Mason Stewart of River Run was seriously injured three years ago at the intersection of Robert Walker Drive and Davidson-Concord Road. 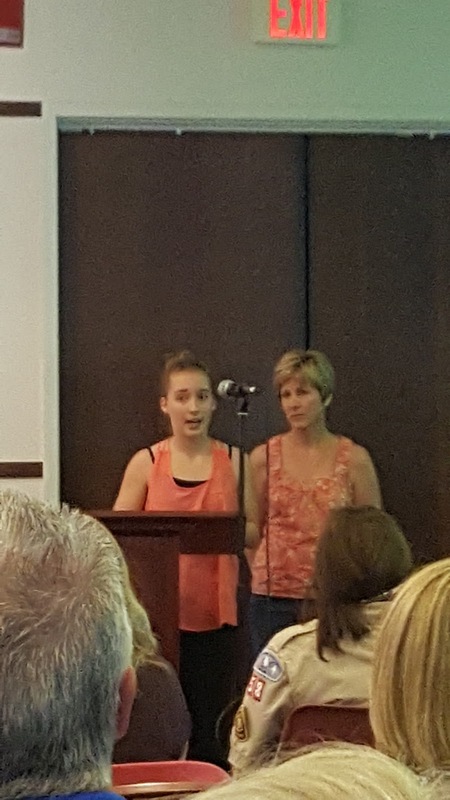 Two of those speakers were Don and Jennifer Stuart, the teen's parents. One of the more poignant moments of the evening came when Don Stewart noticed three boys who were his next door neighbors. The next accident could be any of the kids in the room. When Jennifer Stewart spoke she relayed how she has to go through the very intersection where her son was hit every time she leaves the neighborhood. She drove home the point that it's not a matter of if another serious accident will happen, but when. Their son has recovered, but the next person may not be so lucky. To all this, how did the town respond? They told residents to come back next month when NCDOT is there. They also told people to contact their NCGA representatives, Rep. John Bradford and Senator Jeff Tarte. They said it's a state problem. They passed the buck. Oh, and they said they were going to spend $75,000 this next budget cycle to install more of the flashing beacons around town. The same beacons many were saying do little to nothing at the site of Mason Stuart's accident. It has been three years. Why are citizens just now being asked to contact state representatives? Isn't that sort of what we elect our town representatives to do? And if that was what the town thought citizens should be doing all along, why weren't they encouraging that all along? Here is an example. In 2013 and again in 2015, Davidson Town Hall pulled out all the stops encouraging citizens to contact the General Assembly in a vain attempt to stop a bill that imposed inconsequential limits on the town's ability to enforce design restrictions on single family homes. It was an effort reminiscent of Don Quixote tilting at windmills. They used a big chunk of Federal grant money to write a "Health Impact Assessment" hoping to convince people that their ability to enforce certain types of design on builders was somehow protecting the health and well being of citizens. Ultimately, the bill passed overwhelmingly last year with overwhelming bi-partisan support - a rarity in this day and age. All Davidson Town Hall achieved with its Quixotc effort was wasted political capital. They've proved in the past that they are willing to put effort into applying pressure to Raleigh. It has just been for the wrong things. Hopefully, the message got through Tuesday night that the Town needs to be spending its effort on things that actually matter - like working with NCDOT to do whatever it takes to get the speed limit lowered before someone gets killed. Update: NCGA Rep John Ray Bradford posted this earlier on his Facebook with a link to this story. Good news! The Davidson Police Department does a great job serving our small town. In 2014, the department received renewal of its CALEA accreditation. In 2015, the town was ranked the 2nd safest small municipality in North Carolina - just behind fellow college town, Elon. The town was 3rd safest overall. That's a quantitative testament to the job the department is doing. However, the town does not have all the crime fighting tools it needs, tools that have become standard practise in most urban areas. That would be the use of fixed surveillance cameras that can help solve crimes more quickly when they do occur. To remedy that, the DPD has requested funding in the upcoming budget to install a system of cameras for the town. 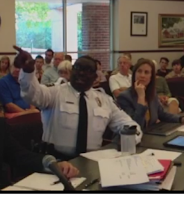 Below is a brief Q&A with Police Chief Miller on the system and the funding request. Q: How many cameras should we expect? A: There will probably be 8 – 10 cameras, plus four (4) license plate readers. Q: Are these Davidson’s first cameras? A: These are Davidson’s first static, cameras to be installed in public space. We have cameras in all the police cruisers; body worn cameras; and one deer camera that we’ve used for problem locations/criminal hot spots. Q: Will they only be at entrances to town such as at Potts/Main, I77 exits and North Main, or will they be all around town? A: We will be positioning them at the major thoroughfares entering town. However, we would like to have at least one portable camera that can be moved to an area where we are experiencing an active crime problem. Q: What kinds of crimes will these help solve? Has this technology been used to help solve crimes in Town before? A: The city of Charlotte has an extensive camera system and they have partnered with private businesses and the NC DOT to increase their camera views. They have had great success using their camera system to close all types of criminal cases. The city of Cornelius also has a wireless camera system and some of their video assisted us in our investigation into the fatal shooting of Jerry Kerns on June 23, 2015. Their system also helped us in an animal abuse investigation. Q: How long will the video captured by these cameras be kept and who monitors it? Is that possibly outsourced, or will the town do that itself? A: The capacity for storage is estimated to be 30-60 days. There will not be a person monitoring the video 24x7. However, if a hot spot is identified, we will have the ability to observe the camera view remotely. Q Has a vendor been selected? 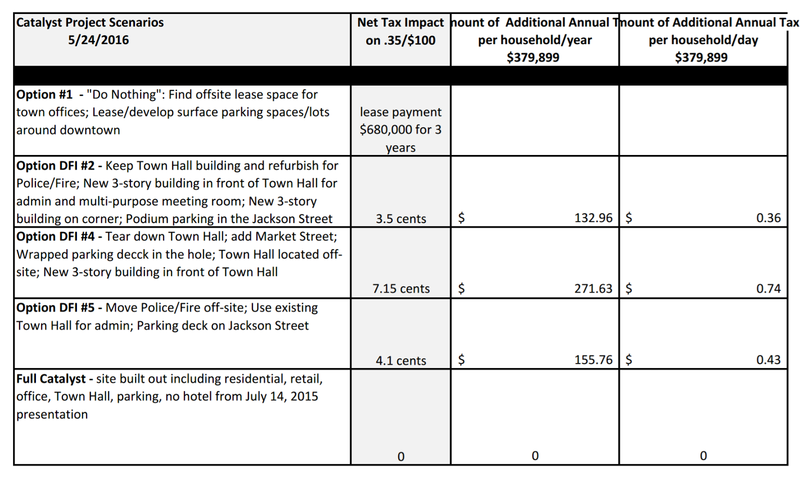 The budget request of $44,442 seems rather specific A: We were working with a vendor who gave us that estimate. Due to an additional desire for flexibility, we decided to explore other options that are the most cost-effective and flexible. Nucentric Solutions (our IT provider) is assisting us in research and developing this system. We used the estimate as a placeholder, and believe we will be able to implement a system for the same cost or less. Some additional research shows that these types of systems can get pretty high tech. The video is stored digitally. Then using what is called "smart search" technology the data is parsed into time segments and analyzed to identify human activity (i.e. people walking) as well as vehicles by size, color and direction. That data can be searched based on specific criteria. If tag readers are used, then the system can be searched for a specific licence plate. For example, let's say police search for a suspect vehicle that's a "red car at Exit 30 between 2am and 3am." If the car is spotted and the tag is captured, the user can then search all camera data for that tag in the time frame before and after that time to see where that vehicle travelled. One can clearly see how this system could be useful in solving crimes, but as importantly in discouraging them from happening if criminals think they will get caught on tape. It should also be noted that these are not the same thing red light cameras which capture data and automatically send tickets. Update May 11th: The town public information officer reached out to aShortChronicle today to let us know the delay in posting this information was due to a lost email. Approval for distribution had been granted, but the information just had not gone out. aShortChronicle does not like making mistakes. In fact, for a blog a significant amount of effort goes into ensuring mistakes don't occur. Town staff can attest to that based on the flurry of questions they regularly receive. However, every now and then they do happen, and when they do corrections need to be made. 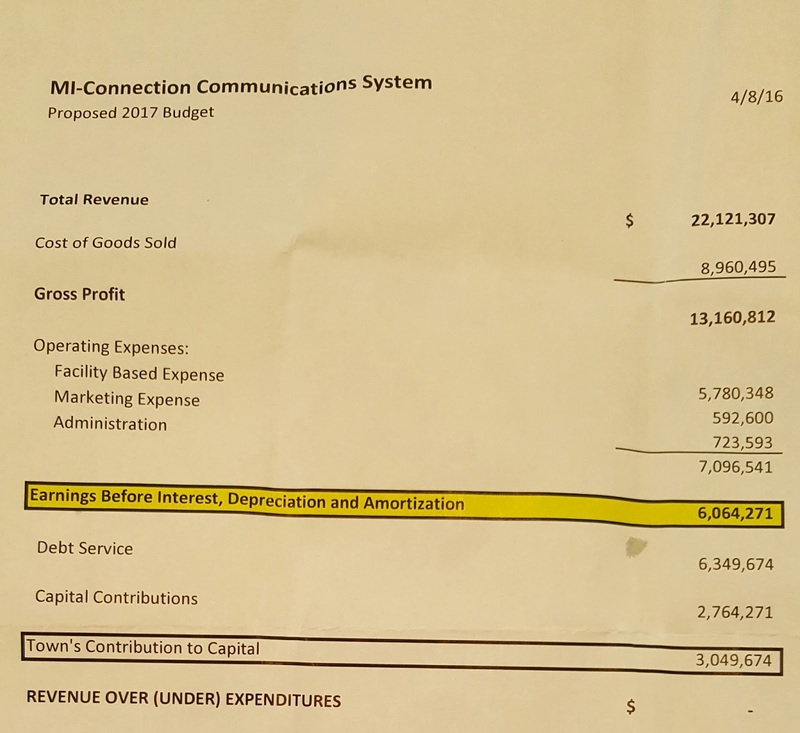 A couple weeks ago we reported that Mi-Connection subsidies would total $3.5 million in FY2017. That was incorrect. The correct number is only $3.05 million. The error occurred due to how a question asked to town staff was phrased. The question was answered, but should have been asked slightly differently. The error was discovered when we came across the below figures in a stack of handouts on the information table in the entrance to Town Hall. Notice the date. APRIL 8TH. After looking back in the town press releases, Facebook postings, budget materials, and the most recent town newsletter since April 8th, it appeared this information has not been widely distributed. As far as we can tell, no media has reported on it. When asked why this had not been distributed, the town Public Information Officer said she was waiting to hear back from MI-Connection CEO David Auger before distributing. Yet, there it was in a stack of printouts for public consumption in the Town Hall lobby. 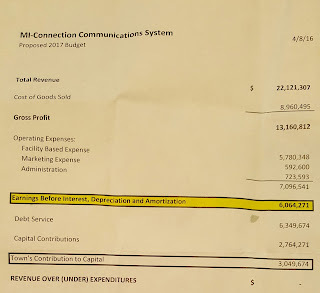 Overall, the new numbers don't impact the current budget discussions as Mi-Connection related expenses won't change for FY2017 from what was previously reported here. Davidson still pays $1 million this year, and very likely will in FY2018 as well. However, it does show that with the current rate of improvement Davidson could see a significant drop in that $1 million per year expense as soon as FY2019. 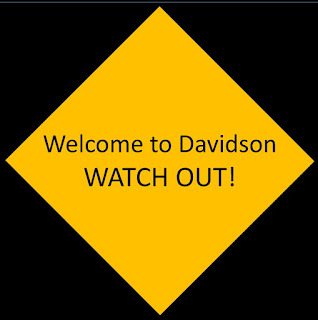 That would be important particularly if Davidson embarks on a large capital spending program for new facilities using millions in debt financing. The freed up cash could be used to prevent the town from having to raise taxes even higher than they already are. Overall $3.05 million is still a lot of red ink, but things are moving in the right direction and moving a bit faster than previously reported. That's welcome news. It should be noted that the numbers on the sheet say "proposed budget". Things of course could change again. Update: At 3:28pm Monday within hours of this post going up, the Town put out the above numbers in a press release. Again, the same numbers dated April 8th - a full month ago. Mayor John Woods goes "Full Catalyst"
The latest quarterly town newsletter landed in Davidson mailboxes on Friday and Mayor John Woods went "Full Catalyst" in his "Mayor's Musings" column. Espousing what can essentially be described as the "grow or die" mantra, Mayor Woods rattled off a bunch of items related to growth that he thinks Davidson needs to embrace - including what sounded suspiciously like the full blown version of the highly controversial Catalyst Project. After a fairly condescending paragraph on the nature of "change" - just to make sure us underlings who don't have the "wisdom" of elected officials get it - Woods had this to say. Nobody would question the need to ensure our public safety departments have what they need. What people do question is leveraging that legitimate need to push something like the Catalys Project. You'll notice Mayor Woods doesn't actually use the words "Catalyst Project" even though the bold portion of his comments perfectly describes that effort. That's how toxic the project has become. 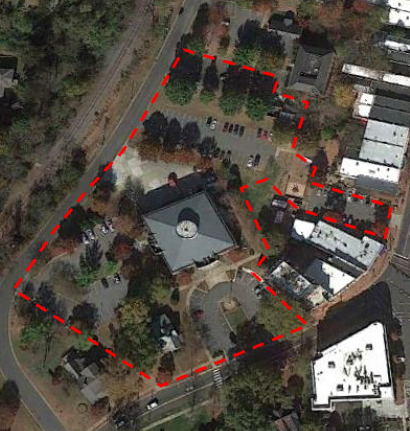 Davidson Town Hall has asked their consultants to look at three options more closely. One of those is to just move public safety out of Town Hall and use the freed up space in the existing Town Hall building for other town needs. That would be a minimally invasive solution without jeopardizing Davidson's small town character. aShortChronicle is looking into information received that indicates the lean might be towards this low impact option versus what Mayor Woods describes. That will be presented as soon as it is more confirmed...or not. On Friday, Davison published the agenda for its upcoming Town Board meeting on Tuesday. 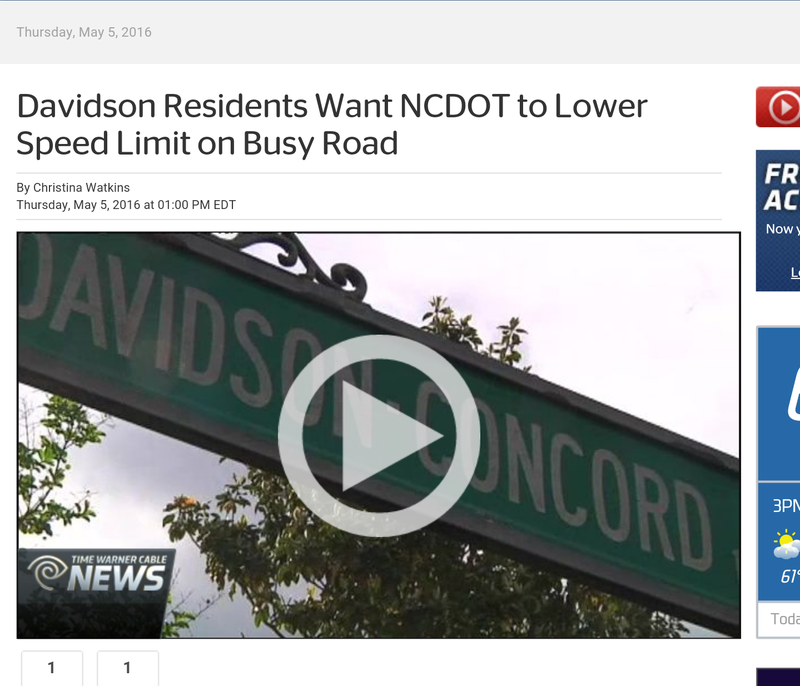 Citizens should take heart that it includes a resolution asking NCDOT to lower the speed on portions of the "Davidson-Concord Speedway" between 73 and the Rocky River roundabout. This resolution is similar to the one passed back in August of 2014 with one critical difference. It asks to lower the speed limit to 45 from 73 to Beaver Dam and then drop to 35 the rest of the way into town. The 2014 resolution asked for 35 the entire length of the road. This is a more reasonable resolution, one that NCDOT should consider. The state agency recently proved it could move fast on safety issues, jumping to attention to fix the timing on the crosswalk lights in town. Tragically, this only occurred after the recent fatality at a crosswalk on Main Street. Here is hoping they listen to the town and help avoid more in the future. Please plan on attending Tuesday's meeting to get your comments on record. Davidson's meetings are video recorded. Having these comments to go along with the resolution will be a powerful combination. Nobody thought we'd be here. Nobody. It's not just the mind boggling fact that Donald Trump is going to be the Rebublican nominee, but also the fact that the Republican primary has ended before the Democrats fully nailed down their choice. So, let's take a look at the Democrat race so far and look at it through the lens of who would make the best candidate against "The Donald". Should it be Hillary or Bernie? Sure, all the polls and the conventional wisdom say either one will beat the "Blowhard Billionaire", but at this point national polls are really meaningless and this race will be anything but conventional. Still, we here at aShortChronicle like our numbers and so we took a look at the results of the Democratic Party primaries to date to see if anything stood out when looking at a general election. It was a bit more interesting than you might think. Take a look at the below chart which has the delegate counts from the actual primaries and caucuses. It does not include Super Delegates. The color scheme and assumptions are explained below. In the general election all that really matters is the Electoral College. The color coding is based on how states are likely to vote in the Electoral College based on the results from the 2012 election. The primaries marked in yellow don't factor in the analysis because they don'thave Electoral College votes. 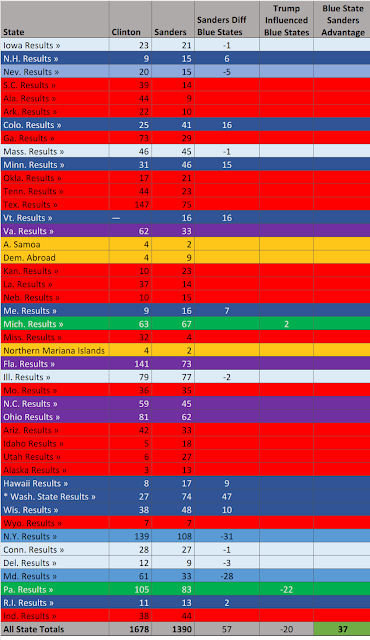 The states marked in red are states where Romney won by 10 points or more. There are a couple of exceptions where it was only 8 or 9 points, but it is still likely that Trump wins these states even if he significantly underperforms Romney's result from last cycle. Said another way, the outcome of the Democratic primary is meaningless in the red states when it comes to the general election. For example, Clinton's biggest delegate haul to date was in Texas, but does anyone believe Texas will be blue this year even with Trump as the Republican nominee? The blue states are likely Democrat Electoral College states. Those are divided into three shades of blue. Darkest blue is a solid Sanders primary win. Medium blue is a solid Clinton primary win. Light blue is where the difference in their delegate count from the primary was 3 or less. Here's the first interesting thing. When you add up the delegates from these blue states, Sanders actually has 57 more delegates chosen to date by actual voters in solid Democrat states. The green states were coded this way actually because Trump is the Republican candidate. Both Michigan and Pennsylvania are likely blue states for any other Republican. However, they are also states with high concentrations of blue collar white voters. That's a group that has been particularly drawn to Trump's populist message - particularly on trade. That's the same message Sanders has been using on that issue. If Clinton is the nominee instead of Sanders, some of the Sanders voter may end up in the Trump camp. Now, before you roll your eyes too much on that one. Read this. On the morning of the Pennsylvania primary, former state Governor Ed Rendell was on NPR downplaying Clinton's expectations. He actually said that Clinton might not get as many voters in the state as she did in 2008 against Obama. She didn't come close. Rendell actually said that was in part because a decent chunk of that white, blue collar demographic had gone to Sanders, and yes, to Trump as well. Overall Dem turnout in Pennsylvania was off about 29% from 2008 and Clinton received 342k fewer votes than she did 8 years ago. Even if you discount that theory and treat Michigan and Pennsylvania as blue states, Sanders has 37 more delegates chosen by voters in blue states. The purple states are the familiar swing states in recent elections. Clinton has a solid advantage in those states. That alone could be why she is the best choice. The unanswered question here is will Sanders voters be guaranteed Clinton voters in the general if their guy is not the nominee. That's probably less likely than if it was ths other way around. This was also pointed out on a recent NPR segment. In 2008, Clinton worked hard to get her supporters behind Obama. She was true blue, life long Democrat. Sanders isn't. He was until this election an independent who proudly called himself a socialist. For him and his followers, pushing to support Clinton will be seen as selling out. All of this begs the question, who really is the best candidate to take on Trump? At this point in the race it is hard to say it is definitely not Sanders. 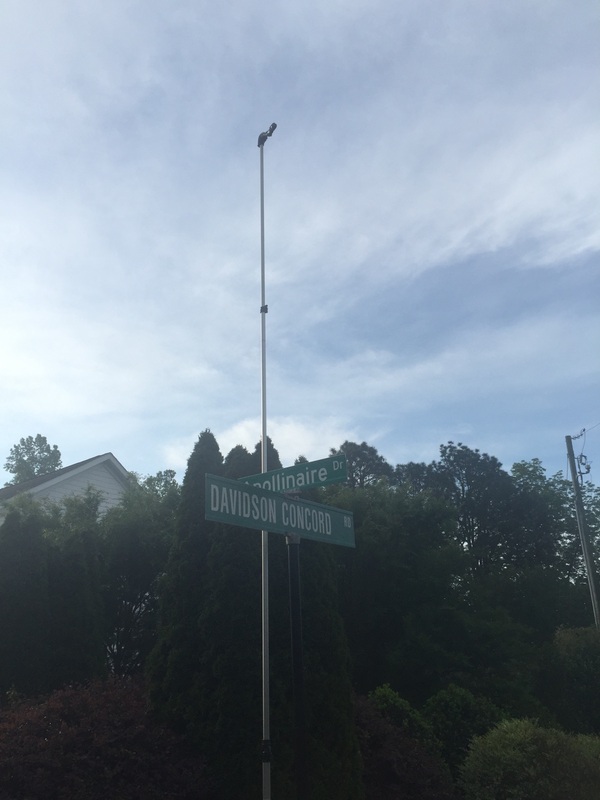 It's time to slow down the "Davidson-Concord Speedway"
If you’ve ever traveled across Davidson’s east side, you are probably familiar with Davidson-Concord Road or what could more accurately be described as the “Davidson-Concord Road Speedway”. The stretch of that road from Highway 73 all the way up to the roundabout at Rocky River has become more dangerous as the area has grown, but the speed limit remains an alarming 55mph for most of it. In fact the speed limit does not drop to 45 until under 2 tenths of a mile before the first of multiple pedestrian crosswalks. The result is a situation where drivers regularly fly through these crossings putting pedestrians at undo risk. It’s a situation that has long concerned residents and one long blown off by NCDOT who controls the road. However, a series of videos that recently surfaced make it a situation the town and the state can no longer ignore. In three videos taken in recent weeks, several mom’s captured multiple incidents occurring while waiting for the school bus at one of these crosswalks. In the first video, numerous cars refuse to stop to let a girl cross the road. In the second, multiple cars drive by a stopped school bus with lights flashing and its stop sign out. The third video captures the chaotic scene of a car accelerating through the crosswalk at over 50pmh just to beat the students who have disembarked the bus and are beginning to cross the road. It's harrowing stuff. Google “Video Davidson-Concord Road Speedway” if you want to see for yourself. 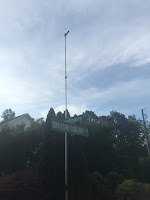 All of this was captured right near the site of a serious accident that occurred three years ago this month when Davidson teenager Mason Stewart was critically injured when he was struck by a vehicle while crossing the road at the intersection of Robert-Walker and Davidson-Concord roads. If something is not done to truly address the issue, it is just a matter of time before tragedy strikes again. To that end, citizens are taking matters into their own hands and preparing to take their message to Davidson Town Hall. 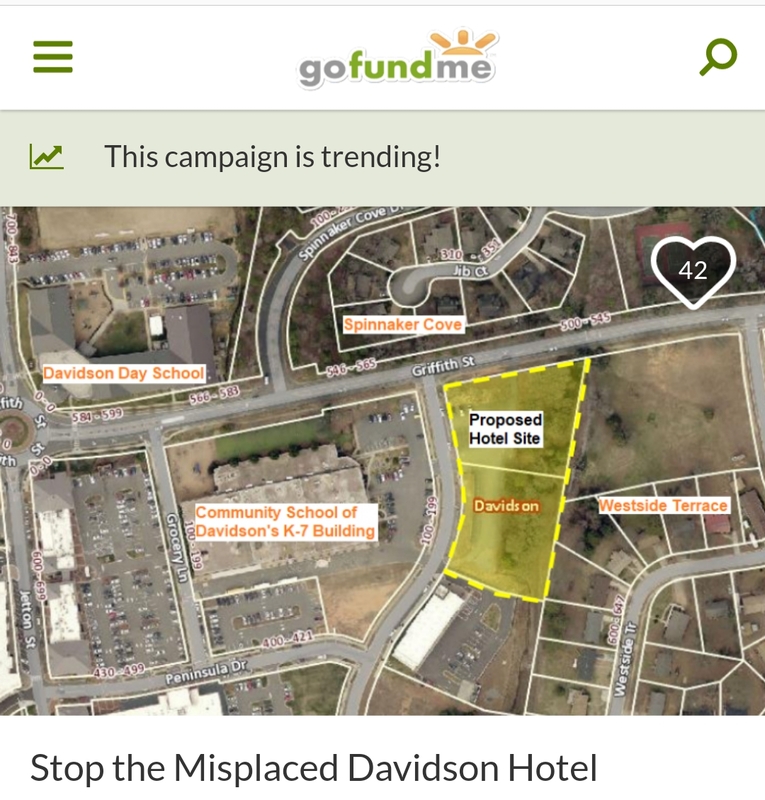 Soon after the blog post containing those videos was posted, a Facebook invite was put out by Vallee Bubak of River Run encouraging people to attend Davidson’s May 10th Board meeting and speak out on the issue. One of the commenters on that invite to town hall was Jennifer Stewart whose son was struck in that previous accident. 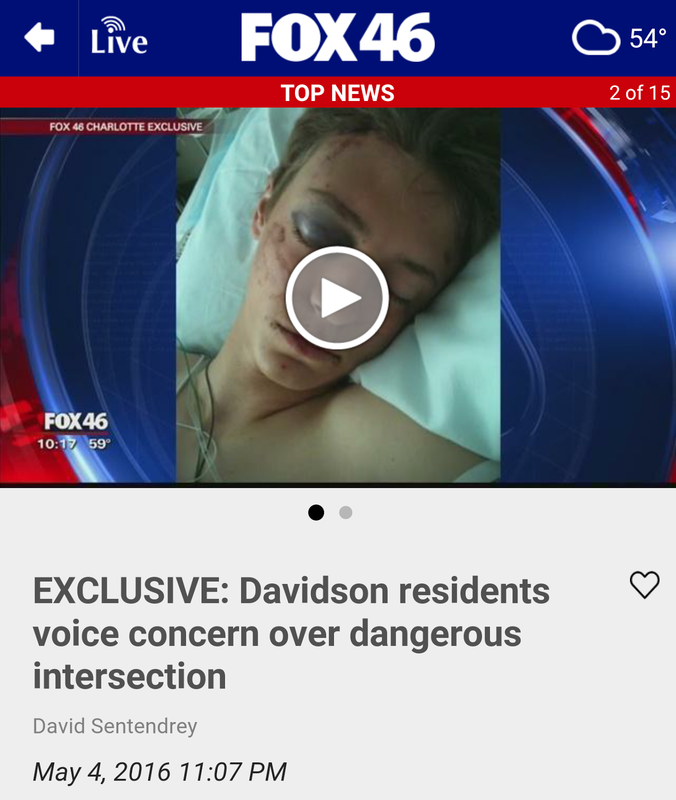 Stewart says as part of her comments that “despite all of our efforts with the Town of Davidson and the NCDOT, safety at the intersection hasn't improved. I'm thankful for the flashing lights the town installed, but sadly they are ignored by most drivers. I shudder to think how dangerous the intersection will become when the new development begins.” That new development she mentions is the 306 unit West Branch neighborhood slated to be built right at the intersection where her son was injured. In a follow up conversation for this story with Ms Stuart, she reiterated her appreciation for the things the town has done, but the fact remains that the speed limit is too fast and that makes the road too dangerous. She pointed out that the next accident victim may not be nearly as lucky as her son. The town needs to do more. It can do more The question is will it do more? Now is the time to push the town to truly fight for a real solution to this safety hazard. There were earlier indications the town planed to invite NCDOT to the meeting, but by deadline the town was not able to confirm if they would attend. However, even if NCDOT does not show, citizens should plan to attend anyway. Nothing says “this is important” to elected officials like a room full of concerned voters. 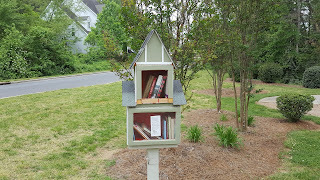 This post forst appeared in this week's Herald Weekly at HuntersvilleHerald.com. Media pressure mounts regarding "Davidson-Concord Speedway"
We broke the story here at aShortChronicle a couple of weeks ago regarding videos showing how truly dangerous Davidson-Concord Road has become for pedestrians. That story has now caught the attention of other local media. Wednesday night Fox46 ran the following story. Thursday, Time Warner Cable news had this piece. Also early Thursday, a press release was sent to local media from Vallee Bubak of Davidson. It contained some interesting research. -From 2008 - 2015 there have been a total of 112 reported accidents on the 2.39-mile stretch from Highway 73 to Rocky River Road. -14 of those accidents (including the one that almost took my son's life) occurred at the intersection of Robert Walker Road). -The current speed limit on this stretch of road is 55 mph and changes to 45 mph at Beaver Dam, although most northbound drivers (like the one who hit my son) choose to ignore or don't notice the change in speed limit. -If the speed limit were lowered by 10mph, safety and driver reaction time would increase significantly and add less than 45 seconds to the drive time. Results show that the average risk of severe injury for a pedestrian struck by a vehicle reaches 10% at an impact speed of 16 mph, 25% at 23 mph, 50% at 31 mph, 75% at 39 mph, and 90% at 46 mph. The average risk of death for a pedestrian reaches 10% at an impact speed of 23 mph, 25% at 32 mph, 50% at 42 mph, 75% at 50 mph, and 90% at 58 mph. Risks vary significantly by age. For example, the average risk of severe injury or death for a 70‐year‐old pedestrian struck by a car travelling at 25 mph is similar to the risk for a 30‐year‐old pedestrian struck at 35 mph. 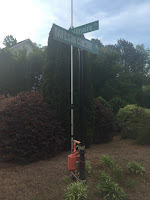 Branch neighborhood at the intersection of Robert Walker Drive and Davidson-Concord Road. That's the neighborhood involving Commissioner Brian Jenest. Click key word "West Branch" on the bottom of this post for the in depth coverage of those votes. Those approvals and that neighborhood WILL make this area even more dangerous. Commissioners have in the past contacted NCDOT about this road and "resolved" to do something about it. To date nothing has caused NCDOT to bend. Residents should plan on attending the 6pm Board meeting this coming Tuesday to ensure they follow through with getting this issue fixed. Now that Davidson Commissioners have approved growth knowing it will make this situation worse, they have ownership and responsibility for resolving it. To some degree, they also own any future accidents that occur in that area if they don't get it done. Pres "The Donald", Veep "The Kasich", Justice "The Cruz"
One of the things to love the most about politics is the complete and utter unpredictability of how things can happen quickly. Less than 24 hours ago, the punditry was furiously analyzing the possibilities of a contested Republican convention. People were mired in the details of obscure RNC rules trying to figure out how Trump could be stopped from getting the nomination. The number 1237 was etched into the brain of every political junkie across the political spectrum as the magic number of delegates Trump needed to secure the nomination outright. Now, with both Cruz and Kasich dropping out of the race, none of that matters. "The Donald" will be "The Republican"...nominee for President of the United States of America. OK. TIME TO MOVE ON. With Trump as the candidate we can be assured of only one thing. This will likely be the nastiest and weirdest presidential election in modern times. As such, a lot of people will tune out. That means this will be a base driven election. Fortunately, or not depending on you point of view, Republicans have a ready made way to satisfy all the main legs of the party base and possibly take some of the air out of the #NeverTrump movement. Trump should say very clearly he would look at Ted Cruz as his nominee to the Supreme Court if the Republicans leave Justice Scalia's seat unfilled. He should also pick Kasich as his running mate for the Vice President spot. While Cruz supporters may hate Trump they would love the idea of Cruz on the Supreme Court in a lifetime position. He would be in position to defend the Constitution in a meaningful way for decades to come. He would be a staunchly conservative voice to replace Scalia's. Approving the appointment would also remove Cruz from the Senate where he's not very popular. The Kasich pick for VP has always seemed obvious. He has been running for that spot since the very beginning - regardless of what he has said to the contrary. Kasich delivers Ohio which makes the path to victory easier no matter who the nominee is at the top of the ticket. He was never going to be conservative enough for the base, but he could be seen as a moderating influence in the VP spot. He is also totally believable as someone "a heartbeat from the Oval Office." Doing those two simple things could unite the party in an unexpected way. Trump clearly has tapped into a populist current. Kasich provides a lifeline to the establishment. Cruz anchors the evangelical and Tea Party wings. That would be a potent combination to get out the base and move this election. There's a saying and politics, "elections have consequences". It's a saying often used to validate actions taken by the victors that the vanquished oppose. This past Saturday, the NCGOP showed there is an adendum to that saying. That adendum is "unless you can orchestrate a coup". In a special meeting of the NCGOP Executive Committee, Party Chairman Hassan Harnett was removed from office by a vote of 200 to 79. The Executive Committe is made up of nearly 600 party officials from across the state. It includes the top 2 officials from each County level party organization, all Republican legislators and other elected officials, all the members of the Central Committe as well as others from the Congressional District conventions, and officers of state level party auxiliaries such as the College Republicans and Republican Men's and Women's organizations. These folks can best be described as the definition of the party "establishment." By the numbers, only about half of the Executive Committee voted on Harnett's removal. Also, 200 voters represents less than half of the votes Harnett's opponent, Craig Collins, received when Harnett was elected last June. When you figure Collins had overwhelming establishment support judging by who endorsed him, it's very reasonable to assume any Executive Committee meeting called to oust Harnett would likely succeed. Still, a 2/3 super majority is hard to achieve. That's the bar the Executive Committee had to reach on Saturday. According to DailyHaymaker.com, Harnett supporters were thought to have about 120 votes going into the meeting which would have been more than enough to stop Harnett's ouster based on the final vote. I am told that during the presentation of "evidence" against Harnett, many people could be seen removing their pro-Harnett stickers. If the Haymaker's numbers were right, about 40 people may have switched their votes. Apparently, the evidence was that damning. And that may be the ultimate lesson in this sad story. If you are going to overthrow the established order of things, you have to make sure you "coup proof" the new regime. One way of doing that is to not do things so out of the norm that it turns even some of your supporters against you.